Every now and again, a truly great athlete shatters all previous assumptions about what’s possible to achieve in a sport. When this happens, opposing teams scramble to find ways to stop them or slow them down. In basketball, teams tried to to stop Shaquille O’Neal by immediately fouling him (the “hack-a-shaq” strategy); in soccer opposing teams continuously foul the great Argentinean player, Leo Messi, before he can dribble through the defense. But in baseball, the solution for stopping the greatest hitter of all time was to actually redesign the game itself. And it started in the 1940s with Ted Williams. Williams thought of himself as the best hitter who ever lived. He wasn’t a humble man but he also wasn’t wrong. In 1941, Williams finished the year batting .406 for the Boston Red Sox. No one has batted above .400 since Ted Williams. Even after leaving baseball to fight in World War II, he came back and was still the best hitter in baseball. But in 1946, Lou Boudreau of the Cleveland Indians was determined to stop Williams. Boudreau was both shortstop and manager of the Indians. He was an extremely ambitious person, and a great player, and he didn’t appreciate that Ted Williams got all the headlines and attention. Boudreau knew that Williams always hit the ball to the right side of the field and as manager he decided that he would shift three infielders to the right with a trio of outfielders backed up behind them. This meant 6 players were on the right side and only one fielder remained on the left. This new symmetry became known as The Boudreau Shift or The Ted Williams shift. 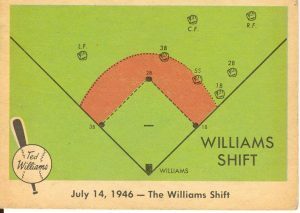 (It’s now mostly called the defensive shift or just “the shift.”) When Williams saw the shift for the first time, he turned to the umpire and said, “What the hell is going on out there there? They can’t do that.” But they could. The shift was totally legal. So Williams had a choice: swing the way he always swung, and possibly hit the ball straight into the wall of fielders on the right side, or go out of his comfort zone and try to hit it to the left. Williams was stubborn. He decided not to alter his natural swing. Over time, this refusal to hit to the left cost him some hits and shaved down his batting average by about 15 points. 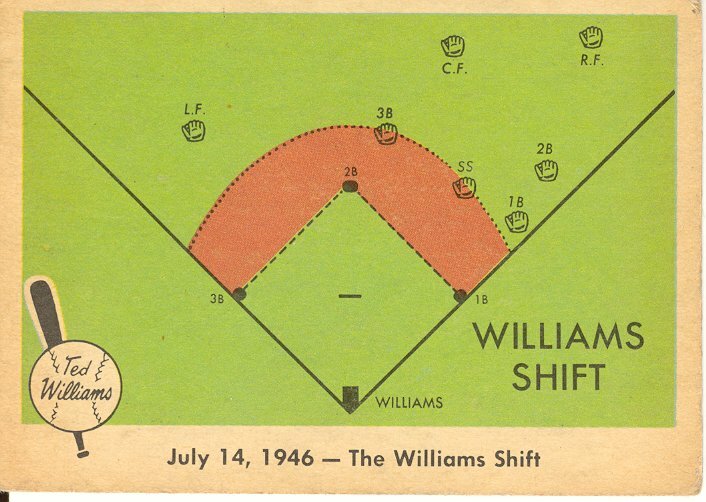 The shift more or less disappeared from baseball after Ted Williams retired. Teams were reluctant to use it because it didn’t always work. And they had no data to tell them whether the risk of using the shift would pay off over time. By the 1990s this had changed, and teams began to collect and study data to find advantages. In baseball, this was called “sabermetrics” and it meant that front offices and general managers might improve their team’s performance without spending a lot of money to get the best players. In 2007, the Tampa Bay Rays, long known as one of the worst teams in all of baseball, began to apply this approach. Their new owner, Stuart Sternberg, brought in the “quants” as they were known, to use data to find hidden advantages. 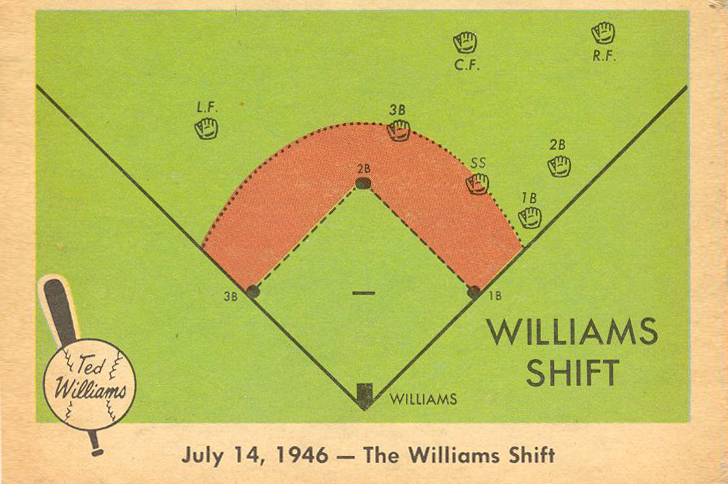 And these data nerds dredged up a tactic from baseball’s distant past: the defensive shift. They believed the shift might give them a two percent advantage over their competition, which was sometimes just enough to win a championship. Right away, the Rays’ new manager, Joe Maddon (and currently the coach of the Chicago Cubs who are in the World Series) started using the shift on all kinds of different hitters. From nowhere, the Rays transformed themselves from a baseball disgrace to a championship contender. And the shift was right at the center of their resurgence. And the shift caught on. Soon every team in the league started using it. In fact, other teams began shifting against the Rays’ own best hitters, including the power hitter, Carlos Peña. In 2007, Peña hit 46 home runs. But in 2008, teams started shifting their defense against him. Now Peña faced the same problem that Ted Williams had faced. But unlike Williams, he didn’t let his ego get in the way. He did something that Ted Williams had only tried a handful of times in his whole career—he bunted. There is nothing pretty about the bunt. When it works, the ball dribbles off the bat toward third base, where no one is around to pick it up. And for Peña, it worked a lot of the time, even if he didn’t always feel good about using it. Bunting, to Peña, felt like “giving in.” But he swallowed his pride and did it anyway. And eventually Peña became one of the most effective and prolific bunters in the majors against the shift. Despite his success combating the shift with the bunt, Peña wishes the shift would be eliminated from the game. Commissioner of Baseball, Rob Manfred, agrees. He thinks the shift makes the game less exciting because it makes it harder to score runs. In many ways, the fight about the shift has become a fight over the nature of the game. Fans and players have bristled at the idea that field decisions are becoming a product of data analysis. So now it’s a fight between the number guys and the traditionalists. Between the nerds and the jocks. But unless there’s a rule change the field will keep shifting. Because it works. This episode of 99% Invisible was a collaboration with FiveThirtyEight, a data journalism site owned by ESPN. It was produced by Joe Sykes with editing from Jody Avirgan and adapted for 99pi by Katie Mingle. 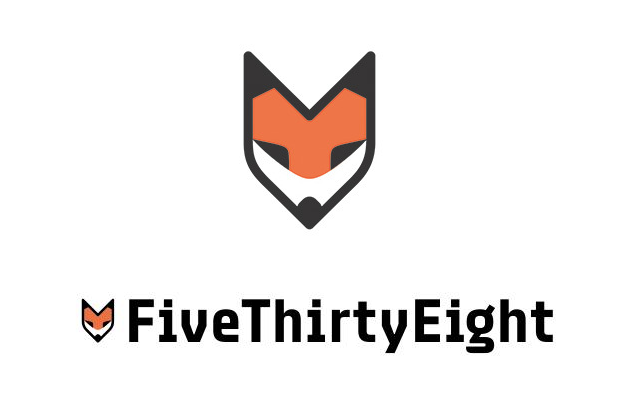 Special thanks to sports reporter Neil Paine, a panelist on FiveThirtyEight’s sports podcast Hot Takedown, which is currently doing a whole series of documentaries called Ahead Of Their Time about players and coaches who were doing something radical but weren’t appreciated in their era. Id be game to eliminate the shift if they also took away the designated hitter! I think all pro baseball players should be able to adapt and learn to hit the ball the other way. Dammit Roman. You made me listen to a sporting ball episode. And it wasn’t bad. Coincidentally, as I write this, it’s the bottom of the 9th in game 7 and the Cubbies and Indians are tied 6 to 6. This reminds me of the Neutral Zone trap in hockey. It led to rule changes including eliminating 2-line offside. I can only imagine this episode was of intense interest to all your beautiful nerds. Sports is always interesting…. Especially American sports. This episode reminded me of the “bodyline” series in cricket. Where rules had to be changed because bowlers were directly targeting the head of the batsman and putting all the fielders in the only place a shot could be played.